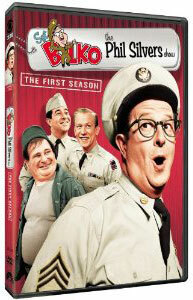 The 1955-56 first season of the sitcom ‘The Phil Silvers Show,’ which is being released on DVD on July 27, is a hilarious depiction of aptly named gifted con man Master Sergeant Ernie Bilko who knows how to take advantage of his fellow soldiers and the failings of the military. It is difficult to imagine anyone other than Silvers playing this role. The show also reflects the tedium associated with peacetime life at a small Army base in rural Kansas. It seems that Bilko schemes both to keep his mind active and to avoid unpleasant duties such as camping out on bivouac, and his escapades entertain even their victims. Most of the 34 episodes from this season have Bilko planning a generally harmless con that goes awry; it is nice as well that Bilko clearly has a conscience and that his ultimate comeuppance for his malfeasance is always mild. He typically ends up in the same place that he was before pulling his con. The first episode of the series sets the tone very well; Bilko is entrusted with virtually every cent that his new soldiers have and proves himself to be a good leader. The DVD set includes an alternate version of this episode that never aired that the set identifies as the audition show. The first season also includes a classic episode in which Bilko’s base is selected to try a rapid-pace processing procedure that ends up accidentally inducting a monkey into the Army. Highlights include a joke that the monkey scored the third highest in the group on the intelligence test and great improvisation by Silvers in response to unpredictable behavior by the monkey. A scene in which Silvers does not miss a beat when the monkey picks up a telephone receiver deserves a place on the list of greatest television moments if it is not already on one. The DVD set is notable as well for including several great extras in addition to the audition show; these include the original opening credits for the show and commercials in which cast members appear in character. My favorite extra was the 1966 episode of “The Lucy Show” titled the “The Efficiency Expert” in which Silvers played a consultant who was hired to improve the operation of the bank where Lucille Ball’s character worked. 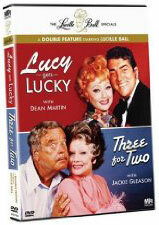 The pair worked very well together, and the great humor included a variation of Ball’s famous scene from “I Love Lucy” in which she worked on an assembly line at a chocolate factory. Fans of Silver or those with questions regarding his show are welcome to e-mail me at tvdvdguy@gmail.com.